"The objectives of a Gathering of the Clans of the Highlands are to foster Clan sentiment and spirit; to cultivate and develop clanship and friendly relations among its members; to maintain, encourage and foster the highland Scot's cultural heritage through the education of its members, its young people, and the public in general." Scottish folk frequently use the term "clan", but no specific definition of the term is accepted by all authorities. The word itself is Gaelic for "children" and was also used as an equivalent for "family". Regardless, a clan is considered to be a group of families that are affiliated by geography or marriage or political necessity. Historically, one of the families eventually moved to the top leadership position, and that family's leader, usually chosen by ancient tribal custom, became the "chief" of the entire clan. Even though an actual family might retain its own name, it was still considered to be a part of the larger clan. Hence, a "Roy", or a "Robertson" is still a part of the larger Clan Donnacaidh, as one small example. 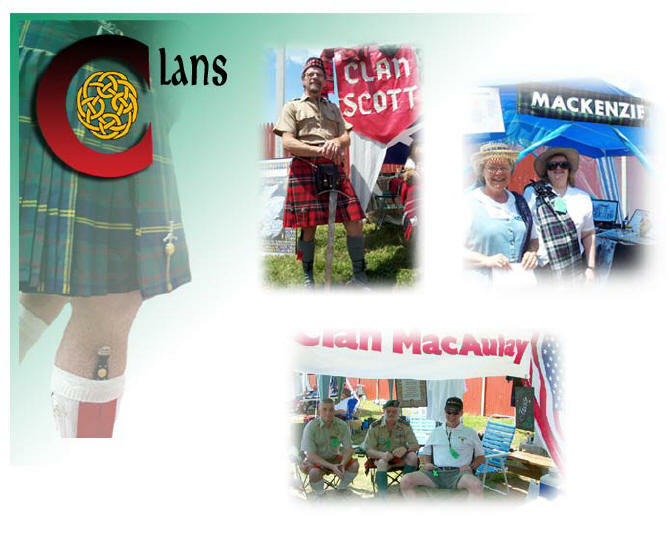 You'll find many clans at the Gulf Coast Celtic Fling & Highland Games, so, visit this site frequently over the coming months and discover the clans that are joining!